This arc–from Globe to “Shakespeare’s Globe,” from playwright to English national icon–is one of the themes traced by the Remembering Shakespeare exhibition. As Matt Hunter has already remarked, the Jubilee festival organized by David Garrick in Stratford upon Avon in 1769 was a significant moment in the “em-Barding” of Shakespeare as an English national treasure. Three items on loan to the exhibition from the collections of Yale University’s Lewis Walpole Library capture the astonishing visual pageantry that Garrick planned for the Shakespeare Jubilee. 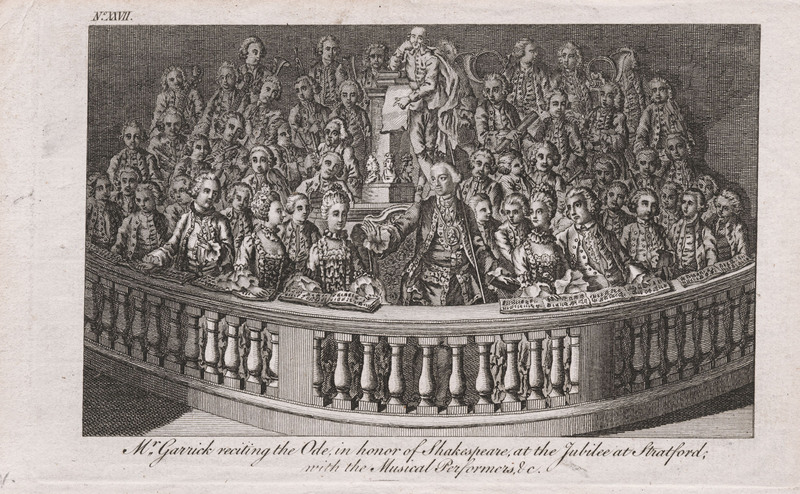 Below, the first of these: a 1769 engraving of Mr Garrick reciting the Ode in honor of Shakespeare at the Jubilee at Stratford; with the musical performers. And yet, of course, this chorus, and Garrick’s ode, were for the most part read, rather than heard, and the spectacle itself seen in print, as here, rather than in performance. One of Garrick’s achievements was to bring Shakespeare performed–or lauded–out of the Jubilee and its later re-staging in the London theatre, and into the visual cultures of print. While not without detractors, some measure of Garrick’s success, and that of his Jubilee, can be seen in William Smith’s 1781 Lessons in elocution, in which Garricks’ Ode follows “Perturbation” (Lear and Merry Wives of Windsor), “Chearfulness” (Titus Andronicus), and Hope (Merchant of Venice) in an appendix of “proper concluding pieces” on the art of speaking, and speaking well, in English.